During my gardening career I have suffered from 150 yellow jacket stings, stepped on a copperhead, and been gouged by a Tetrapanax stump. After experiencing the latter, I began wondering if the garden were trying to kill me. Now this isn’t a feel-sorry article; rather it’s about treating the garden and Mother Nature with some respect. Typically we begin to regard our garden as a magical piece of Eden, forgetting that there was also a Tree of Knowledge with enticing apples. Gradually we discover that the garden also contains some pitfalls. We want bees and wasps, just as we treasure all our pollinators—without pollinators our gardens wouldn’t be gardens. However, the wasps we call yellow jackets pose an occasional problem in the garden because their nests are underground—step inadvertently on the ground entrance and you will suddenly be aware of the nest’s existence. One false step causes an army of yellow jacket warriors to come out to defend their turf. Depending upon the location of the nest, it can be hard to live in harmony with the yellow jackets. Once their nest was in the middle of one of my two grassy areas, which meant that anyone cutting the grass was subjected to an attack. Once the nest was located at the edge of the perennial border, a location that was hard to avoid. Now I believe in peaceful coexistence but sometimes it’s impossible to live with these aggressive warriors who will follow you, repeatedly stinging you, if you are tactless enough to intrude on their territory. In this case I have had to resort to chemical warfare, something I’m not proud of, but I can only sustain so many stings. The copperhead story went like this: I was peacefully walking over a mulched area when I realized I had stepped on something. I looked down to see a copperhead that was as horrified as I was—I went in one direction and it went in the other. Why hadn’t I seen it? It was perfected camouflaged against the pine bark mulch. In the heat of the summer my neighbor has discovered that the copperheads like to find refuge in her pots. Copperheads will also dig under my cement pavement in an effort to be cool. All this is not said to scare but to state that vigilance is required. Stumps on the ground and stubs on shrubs can be a problem. I ran into a small Tetrapanax stump when I moved the wrong way—I didn’t trip or fall on it, but my foot slipped and the stump gouged me. Likewise it’s easy to pass by a spirea closely without seeing the stub sticking out about four inches, a stub that can gore you if you don’t see it. 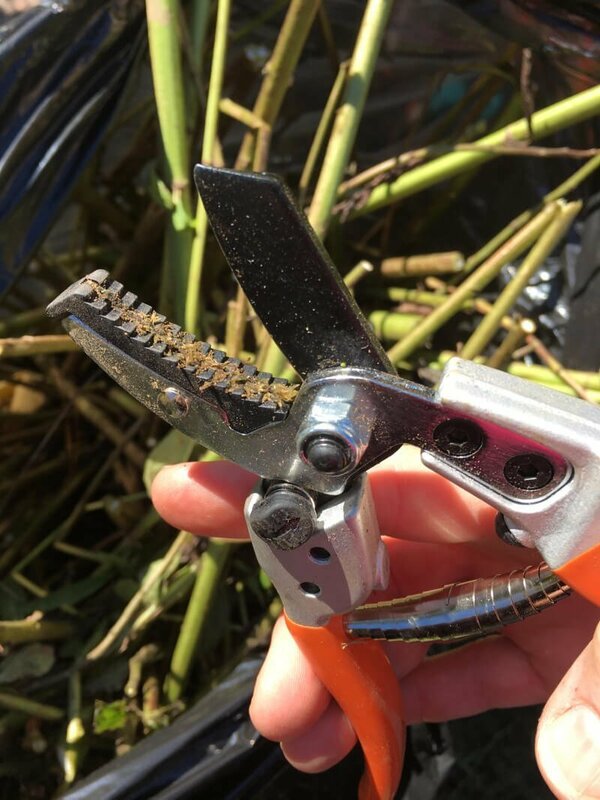 For this reason it’s important to prune dead branches and those dead rose canes that can be covered up in the height of the growing season. For protection I advocate wearing long pants while gardening. It’s better to have that rose cane make a hole in your pants than on your skin. Always wear good, sturdy shoes to garden—flip-flops will give you little protection should you inadvertently step on a yellow jacket nest or a snake. As a rose gardener, I always advocate gardening with a good pair of gardening gloves. Above all, make sure your tetanus shot is up to date: once every ten years. None of this is meant to scare. Rather it behooves us to have respect for the garden and Mother Nature. We are all intertwined but sometimes we have to protect ourselves from that Tree of Knowledge.